Sûkerbôle or suikerbrood is a traditional bread from the northern province of Friesland, in Holland. Other provinces such as Limburg and Brabant have a similar recipe for sugary bread loafs but what makes it Frisian is the high amount of sugar. 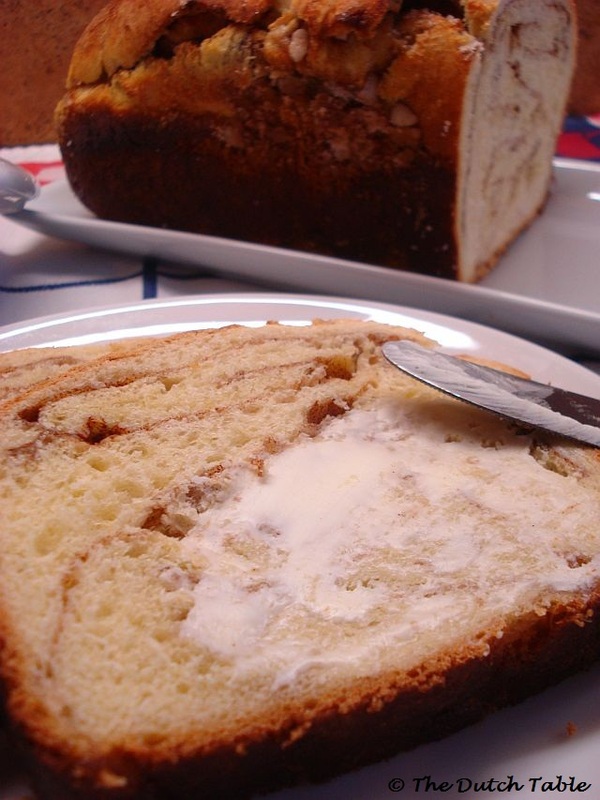 In comparison to other regional recipes, Frisians use twice as much sugar. The sûkerbôle was often given to a new mother to celebrate the arrival of a baby-girl; for baby-boys it was a raisin cake. 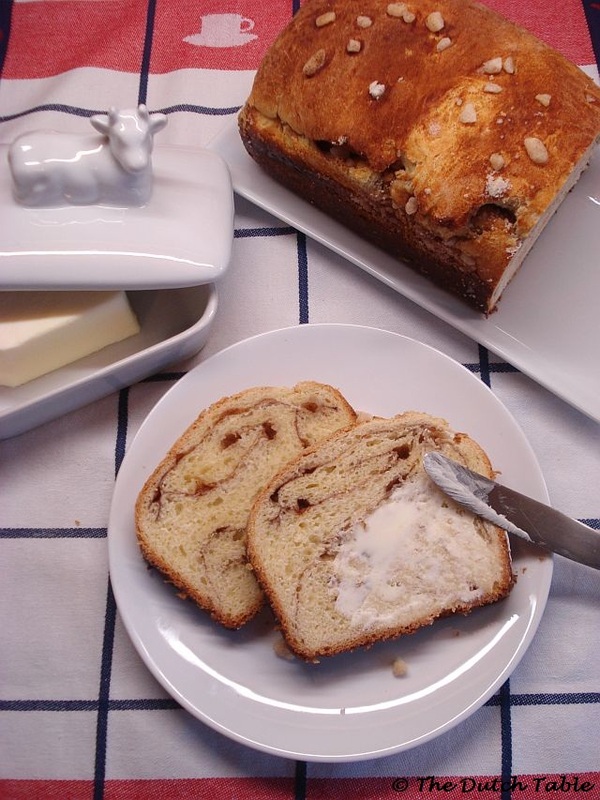 The sugar used for this recipe is called pearl sugar and hard to find in a regular store. Crushed up sugar cubes are a good substitute: add half a cup of cubes to a towel, fold it and whack it with a rolling pin. Not too hard! You want to have sugar lumps, not finely ground sugar. Handfold these lumps in the dough after the first rise. Add the yeast to the warm milk. In a mixing bowl, mix the flour with the salt. Pour in the milk and yeast and mix together. Knead in the ginger syrup, the eggs one by one and 3/4s of melted butter until the dough forms a soft and flexible dough. Cover and rise until double its size. On a lightly floured counter, roll out the dough in a square and cover with the sugar and the cinnamon. 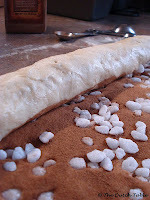 Now roll the dough into a loaf shape (first fold the sides towards each other, covering the sugar and cinnamon, then roll forward into a loaf). Butter the inside of a bread loaf pan heavily. Put a tablespoon of sugar in the pan and tilt it forward towards each side so that the sugar coats the whole inside. Place the loaf inside, seam down. Cover and rise for about 15 minutes, or until loaf peaks out from inside the pan. In the meantime, heat your oven to 375F degrees. Brush the top of the loaf with the rest of the butter and spread the remainder of the sugar over the top. Bake for 30 minutes or until loaf is done. If the top browns too quickly, tent the loaf with aluminum foil. Cool the loaf for about twenty minutes, then carefully loosen the bread from the pan: some of the sugar may have caused the bread to stick to the pan. Remove the loaf and continue to cool on a rack. Awesome with a curl of real butter! * If you don't have ginger syrup, don't worry. I boil a small piece of candied ginger and a tablespoon of sugar in a cup of water for a minute or two and let it steep overnight. Should be just fine! Ah, my one attempt to make this did not end well; it was a recipe from Bernard Clayton's Complete Book of Breads, and the sugar cubes dissolved throughout the loaf when I kneaded them in. It did not include the ginger syrup in the formula, either. I can't wait to try this! My father is Frisian (Veltman probably doesn't seem very Frisian, not ending in a -sma or a -stra, I know). Which I suppose, makes me part Frisian - by descent only of course, as I can't even speak Fries, much less Dutch. I figure if I can master this, it will be something! Maria, you'll do just fine! I'm always hesitant to knead in lumpy or sharp things like sugar cubes, seeds etc because they can cut through the strands of gluten the yeast has been working so hard on. In this recipe, I pat out the dough, sprinkle the sugary lumps and the cinnamon on top, fold it and roll it into a loaf after the first rise. That way, the sugar doesn't cut the dough nor does it melt as much. 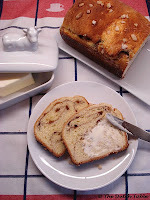 You will find some sugary, gooey pockets though, that's what makes this bread so unique! Have fun with it, it's a great bread for these wintery days. I have been baking breads regularly for the last 10+ years, and in searching for an alternative to Bernard Clayton's Frisian Sugar Loaf recipe I came across this web site. Unfortunately I have to report that this is easily one of the worst bread recipes I've ever tried. I'm known for my obsessive attention to detail when it comes to bread baking, so I find it hard to believe that the error is mine, though anything is possible. I never even made it to the first rising--what is described as "a soft and flexible dough" ended up being more like a tough, crumbly mass. This is what I get for trying an internet recipe. My Dad was a baker in Frisland by trade before immigrating to Canada in 1952 when I was 7 months old. We grew up eating home-baked breads, cookies, and cakes of all kinds and my favorite was his sukerbole; especially warm out of the oven slathered with butter. It's making my mouth water even now. Unfortunately we never wrote down his recipe. He also made the best krentenbole (sp?) absolutely full of currents. Delicious! Fran, thanks for the note! You lucky girl...warm sukerbole out of the oven sound like heaven! Krentenbollen are good too, but sukerbole.....yum! How unfortunate that you do not have the recipe....I would say, just start baking and adjust the recipe as you go. Keep us posted! in Chinese/Asian stores you can get the sugar you need for this.